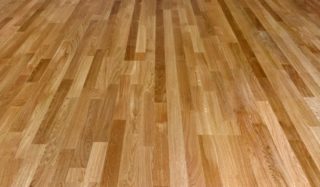 As a flooring material, wood is superior to vinyl or carpet both practically and aesthetically. A solid wood floor is more than a covering. It also adds strength and stability to the floor system. A 1-inch thickness of wood has the same insulating value as 15-inches of concrete. Wood is durable and long lasting. Occasional sanding and refinishing essentially results in a brand new floor. Wood floors don’t retain mildew or absorb dust, simplifying cleaning. Perhaps the most appealing characteristics of wood flooring, though, are its attractive appearance and natural warmth. A beautiful wood floor can enliven a drab room, enhance any architectural style, compliment furniture and design schemes, and add value to any home or building. A combination of qualities should be considered when selecting a species for flooring; appearance related attributes such as texture, grain and color; as well as mechanical properties such as dimensional stability, durability, and ease in finishing; and finally, availability and cost. The properties affecting appearance include many different factors, from the nature of the living tree to the way the lumber is sawed, affect the way the finished floor will look. Heartwood and sapwood are possibilities. Heartwood is the older, harder, central part of the tree. It usually contains deposits of various materials that frequently give it a darker color than sapwood. It is denser, less permeable and more durable than the surrounding sapwood. Sapwood is the softer, younger, outer portion of a tree that lies between the cambium (formative layer just under the bark) and the heartwood. It is more permeable, less durable and usually lighter in color than the heartwood. The relative amounts of heartwood and sapwood in a flooring batch may affect the way it accepts stain and finish and, therefore, the finished appearance of the floor. In general, quartersawn and riftsawn flooring will contain less sapwood than plain sawn flooring and will tend to have a straighter grain and more uniform appearance. The wood grain and texture is also a factor. “Grain” and “Texture” are loosely used to describe similar properties of wood. Grain is often used in reference to annual growth rings, as in “fine” or “coarse” grain: it also is used to indicate the direction of fibers, as in straight, spiral and curly grain. The direction of the grain, as well as the amount of figuring in the wood, can affect the way it is sanded and sawed. Grain also is described as being either “open” or “closed,” referring to the relative size of the pores, which affects the way a wood accepts stain and finishes. Texture usually refers to the finer structure of the wood, rather than to the annual rings. It is sometimes used to combine the concepts of density and degree of contrast between spring wood and summer wood in the annual growth rings. A wood flooring professional should understand this and be able to explain and show you each of these examples.